Labour says it would bring forward its pledge to scrap tuition fees to include students starting university in England this autumn if it wins the election. The party also says students part-way through their courses would not have to pay for the remaining years. Jeremy Corbyn said Labour would “lift this cloud of debt and make education free for all”. 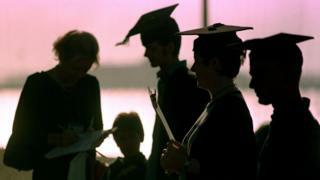 The Tories said more students than ever from disadvantaged backgrounds were getting into university. Labour announced it would abolish university tuition fees – which are due to rise to £9,250 a year in the autumn – in its manifesto last week. It is now offering more detail on the policy, which applies to students resident in England studying for their first degree at an English university, in an appeal aimed at people eligible to vote for the first time on 8 June. It comes as the deadline for people to register to vote approaches – they have until 23:59 BST on Monday to sign up. Labour said legislation would be in place for students starting university in the autumn of 2018 – but that a Labour government would immediately write off the first year of fees for those starting a year earlier. Labour also said it would protect people who had already graduated from inflation-busting interest rises in future years. It said the £9.5bn annual cost of abolishing tuition fees would be paid for by increasing corporation tax, and income tax for people earning over £80,000. “Students will benefit from having more money in their pockets, and we will all benefit from the engineers, doctors, teachers and scientists that our universities produce,” Mr Corbyn said. Labour has also promised the return of maintenance grants to cover living costs. Education is a devolved matter, with only Scotland charging no tuition fees for UK students, although research suggests Scotland also has a bigger access gap between rich and poor students than the rest of the UK.